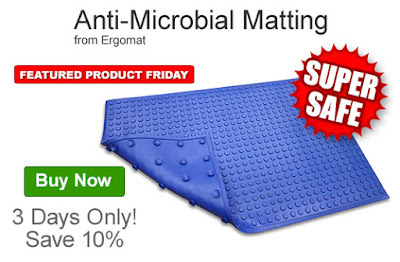 Save 10% off our already low prices on Ergomat’s Super-Safe Smooth Anti-Microbial Matting. Our FPF032516 Coupon Code is auto applied when you add these socks to your shopping cart. This Featured Product Friday (FPF) promo is valid from today, March 25, 2016 through Sunday, March 27, 2016 and the code is unlimited use. Ergomat’s latex-free, beveled Super-Safe Mats are highly resistant to a variety of pH & chemical exposures, feature anti-microbial additives, and have positive grip suction cups on the underside of the mat. For further questions about Featured Product Friday, please read our informational blog post, call us (800-966-6020), or send us an email. Please note: This promo is valid only at QSource.com and expires on March 27, 2016.